EO.Finance helps you to manage your funds. We provide current accounts in more than 50 different crypto and fiat currencies. 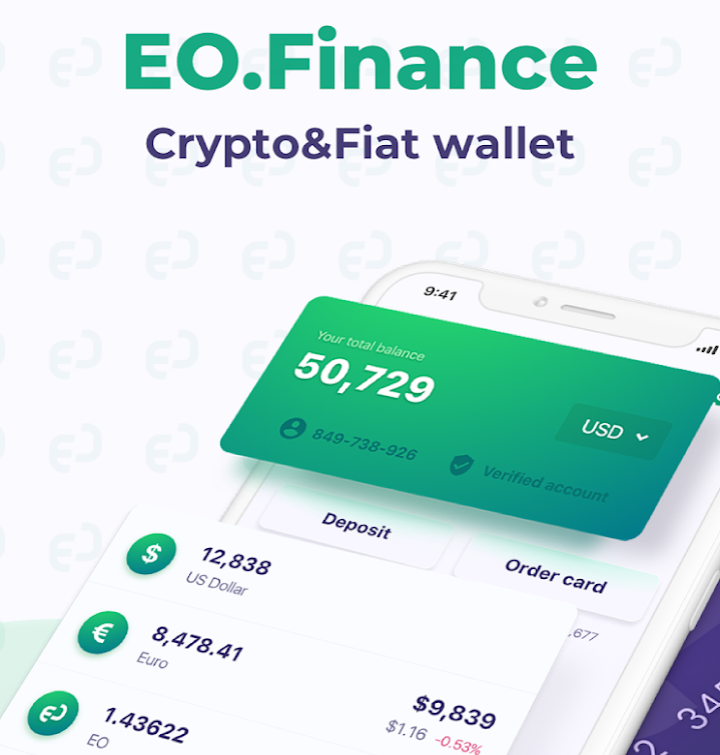 EO.Finance is an evolution towards a truly open financial system. We are creating a new economy by merging the crypto and fiat markets. Our vision is to revolutionize the financial world by providing a fully-rounded ecosystem for financial services. EOconomy is a new economic model where products and services can be purchased using blockchain and traditional currencies. • Deposit Bitcoin Cash, Ethereum or any other crypto from crypto wallets: Coinbase, Electrum, MyEtherWallet (MEW), Metamask, JAXX, Ethereum wallet, MIST, Wirex, Revolut, Exodus, Luno, Bitcoin core, imToken, Waves Wallet, Trust Wallet, Coinomi, BitPay, BTC.com.